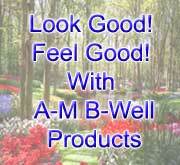 Bibliography - A-M B-WELL inc.
· American Heart Association. Fish and Omega-3 Fatty Acids. Accessed June 12, 2006 at http://www.americanheart.org/presenter.jhtml?identifier=4632. · Burdge G. Alpha-linolenic acid metabolism in men and women: nutritional and biological implications. Curr Opin Clin Nutr Metab Care. 2004;7(2):137-144. · Burdge GC, Calder PC. Conversion of alpha-linolenic acid to longer-chain polyunsaturated fatty acids in human adults. Reprod Nutr Dev. 2005 Sep-Oct;45(5):581-97. Review. · Burdge GC, Finnegan YE, Minihane AM, Williams CM, Wootton SA. Effect of altered dietary n-3 fatty acid intake upon plasma lipid fatty acid composition, conversion of [13C]alpha-linolenic acid to longer-chain fatty acids and partitioning towards beta-oxidation in older men. Br J Nutr. 2003 Aug;90(2):311-21. · Burdge GC, Jones AE, Wootton SA. Eicosapentaenoic and docosapentaenoic acids are the principal products of alpha-linolenic acid metabolism in young men. Br J Nutr. 2002;88(4):355-364. · Burdge GC, Wootton SA. Conversion of alpha-linolenic acid to eicosapentaenoic, docosapentaenoic and docosahexaenoic acids in young women. Br J Nutr. 2002;88(4):411-420. · Cunnane SC. Problems with essential fatty acids: time for a new paradigm? Prog Lipid Res. 2003;42(6):544-568. · Gerster H. Can adults adequately convert alpha-linolenic acid (18:3n-3) to eicosapentaenoic acid (20:5n-3) and docosahexaenoic acid (22:6n-3)? Int J Vitam Nutr Res. 1998;68(3):159-73. Review. · Giltay EJ, Gooren LJ, Toorians AW, Katan MB, Zock PL. Docosahexaenoic acid concentrations are higher in women than in men because of estrogenic effects. Am J Clin Nutr. 2004;80(5):1167-1174. · Hamazaki T, Okuyama H. The Japan Society for Lipid Nutrition recommends to reduce the intake of linoleic acid. A review and critique of the scientific evidence. World Rev Nutr Diet. 2003;92:109-32. Review. · Muskiet FA, Fokkema MR, Schaafsma A, Boersma ER, Crawford MA. Is docosahexaenoic acid (DHA) essential? Lessons from DHA status regulation, our ancient diet, epidemiology and randomized controlled trials. J Nutr. 2004;134(1):183-186. · Nakamura MT, Nara TY. Structure, function, and dietary regulation of delta6, delta5, and delta9 desaturases. Annu Rev Nutr. 2004;24:345-376. · Rodriguez-Cruz M, Tovar AR, del Prado M, Torres N. [Molecular mechanisms of action and health benefits of polyunsaturated fatty acids] Rev Invest Clin. 2005 May-Jun;57(3):457-72. Review. Spanish. · Sampath H, Ntambi JM. Polyunsaturated fatty acid regulation of gene expression. Nutr Rev. 2004;62(9):333-339. · Shahidi F, Miraliakbari H. Omega-3 fatty acids in health and disease: part 2--health effects of omega-3 fatty acids in autoimmune diseases, mental health, and gene expression. J Med Food. 2005 Summer;8(2):133-48. Review. · Simopoulos AP, Leaf A, Salem N, Jr. Workshop statement on the essentiality of and recommended dietary intakes for Omega-6 and Omega-3 fatty acids. Prostaglandins Leukot Essent Fatty Acids. 2000;63(3):119-121. · Stillwell W, Wassall SR. Docosahexaenoic acid: membrane properties of a unique fatty acid. Chem Phys Lipids. 2003;126(1):1-27. · Williams CM, Burdge G. Long-chain n-3 PUFA: plant v. marine sources. Proc Nutr Soc. 2006 Feb;65(1):42-50. Review. · Zampelas A, Paschos G, Rallidis L, Yiannakouris N. Linoleic acid to alpha-linolenic acid ratio. From clinical trials to inflammatory markers of coronary artery disease. World Rev Nutr Diet. 2003;92:92-108. Review. · Aizer A, Gaziano M, MansonJE, Buring JE, Albert CM. Relationship between fish consumption and the development of atrial fibrillation in men. Oral Abstract Sessions AB03, Abstract AB03-2, presented at the 27th annual meeting of the Heart Rhythm Society, Thursday, May 18, 2006, Boston, USA. · Albert CM, Campos H, Stampfer MJ, Ridker PM, Manson JE, Willett WC, Ma J. Blood levels of long-chain n-3 fatty acids and the risk of sudden death. N Engl J Med. 2002 Apr 11;346(15):1113-8. · Ascherio A, Rimm EB, Giovannucci EL, Spiegelman D, Stampfer M, Willett WC. Dietary fat and risk of coronary heart disease in men: cohort follow up study in the United States. BMJ. 1996;313(7049):84-90. · Austin MA, Hokanson JE, Edwards KL. Hypertriglyceridemia as a cardiovascular risk factor. Am J Cardiol. 1998;81(4A):7B-12B. · Balk E, Chung M, Lichtenstein A, et al. Effects of omega-3 fatty acids on cardiovascular risk factors and intermediate markers of cardiovascular disease. Evid Rep Technol Assess (Summ). 2004(93):1-6. · Bemelmans WJ, Lefrandt JD, Feskens EJ, et al. Increased alpha-linolenic acid intake lowers C-reactive protein, but has no effect on markers of atherosclerosis. Eur J Clin Nutr. 2004;58(7):1083-1089. · Bucher HC, Hengstler P, Schindler C, Meier G. N-3 polyunsaturated fatty acids in coronary heart disease: a meta-analysis of randomized controlled trials. Am J Med. 2002 Mar;112(4):298-304. · Burr ML, Ashfield-Watt PA, Dunstan FD, Fehily AM, Breay P, Ashton T, Zotos PC, Haboubi NA, Elwood PC. Lack of benefit of dietary advice to men with angina: results of a controlled trial. Eur J Clin Nutr. 2003 Feb;57(2):193-200. · Burr ML, Fehily AM, Gilbert JF, et al. Effects of changes in fat, fish, and fibre intakes on death and myocardial reinfarction: diet and reinfarction trial (DART). Lancet. 1989;2(8666):757-761. · Calo L, Bianconi L, Colivicchi F, Lamberti F, Loricchio ML, de Ruvo E, Meo A, Pandozi C, Staibano M, Santini M. N-3 Fatty acids for the prevention of atrial fibrillation after coronary artery bypass surgery: a randomized, controlled trial. J Am Coll Cardiol. 2005 May 17;45(10):1723-8. · Daviglus ML, Stamler J, Orencia AJ, et al. Fish consumption and the 30-year risk of fatal myocardial infarction. N Engl J Med. 1997;336(15):1046-1053. · Dayton S, Pearce ML, Goldman H, et al. Controlled trial of a diet high in unsaturated fat for prevention of atherosclerotic complications. Lancet. 1968;2(7577):1060-1062. · de Lorgeril M, Salen P, Martin JL, Monjaud I, Delaye J, Mamelle N. Mediterranean diet, traditional risk factors, and the rate of cardiovascular complications after myocardial infarction: final report of the Lyon Diet Heart Study. Circulation. 1999;99(6):779-785. · Dolecek TA. Epidemiological evidence of relationships between dietary polyunsaturated fatty acids and mortality in the multiple risk factor intervention trial. Proc Soc Exp Biol Med. 1992;200(2):177-182. · Frantz ID, Jr., Dawson EA, Ashman PL, et al. Test of effect of lipid lowering by diet on cardiovascular risk. The Minnesota Coronary Survey. Arteriosclerosis. 1989;9(1):129-135. · Frost L, Vestergaard P. n-3 Fatty acids consumed from fish and risk of atrial fibrillation or flutter: the Danish Diet, Cancer, and Health Study. Am J Clin Nutr. 2005 Jan;81(1):50-4. · Gillum RF, Mussolino ME, Madans JH. The relationship between fish consumption and stroke incidence. The NHANES I Epidemiologic Follow-up Study (National Health and Nutrition Examination Survey). Arch Intern Med. 1996;156(5):537-542. · Gruppo Italiano per lo Studio della Sopravvivenza nell'Infarto miocardico. Dietary supplementation with n-3 polyunsaturated fatty acids and vitamin E after myocardial infarction: results of the GISSI-Prevenzione trial. Lancet. 1999;354(9177):447-455. · Guallar E, Hennekens CH, Sacks FM, Willett WC, Stampfer MJ. A prospective study of plasma fish oil levels and incidence of myocardial infarction in U.S. male physicians. J Am Coll Cardiol. 1995 Feb;25(2):387-94. · Harris WS. n-3 fatty acids and serum lipoproteins: human studies. Am J Clin Nutr. 1997;65(5 Suppl):1645S-1654S. · He K, Rimm EB, Merchant A, et al. Fish consumption and risk of stroke in men. JAMA. 2002;288(24):3130-3136. · Hooper L, Thompson RL, Harrison RA, Summerbell CD, Moore H, Worthington HV, Durrington PN, Ness AR, Capps NE, Davey Smith G, Riemersma RA, Ebrahim SB. Omega 3 fatty acids for prevention and treatment of cardiovascular disease. Cochrane Database Syst Rev. 2004 Oct 18;(4):CD003177. Review. · Hu FB, Bronner L, Willett WC, et al. Fish and omega-3 fatty acid intake and risk of coronary heart disease in women. JAMA. 2002;287(14):1815-1821. · Hu FB, Stampfer MJ, Manson JE, et al. Dietary intake of alpha-linolenic acid and risk of fatal ischemic heart disease among women. Am J Clin Nutr. 1999;69(5):890-897. · Iso H, Rexrode KM, Stampfer MJ, et al. Intake of fish and omega-3 fatty acids and risk of stroke in women. JAMA. 2001;285(3):304-312. · Keli SO, Feskens EJ, Kromhout D. Fish consumption and risk of stroke. The Zutphen Study. Stroke. 1994;25(2):328-332. · Kris-Etherton PM, Harris WS, Appel LJ. Omega-3 fatty acids and cardiovascular disease: new recommendations from the American Heart Association. Arterioscler Thromb Vasc Biol. 2003;23(2):151-152. · Kris-Etherton PM, Hecker KD, Binkoski AE. Polyunsaturated fatty acids and cardiovascular health. Nutr Rev. 2004;62(11):414-426. · Kromhout D, Bosschieter EB, de Lezenne Coulander C. The inverse relation between fish consumption and 20-year mortality from coronary heart disease. N Engl J Med. 1985;312(19):1205-1209. · Kromhout D, Feskens EJ, Bowles CH. The protective effect of a small amount of fish on coronary heart disease mortality in an elderly population. Int J Epidemiol. 1995;24(2):340-345. Dolecek TA, Granditis G. Dietary polyunsaturated fatty acids and mortality in the Multiple Risk Factor Intervention Trial (MRFIT). World Rev Nutr Diet. 1991;66:205-216. · Lands WE. Primary prevention in cardiovascular disease: moving out of the shadows of the truth about death. Nutr Metab Cardiovasc Dis. 2003 Jun;13(3):154-64. Review. · Leaf A, Xiao YF, Kang JX, Billman GE. Prevention of sudden cardiac death by n-3 polyunsaturated fatty acids. Pharmacol Ther. 2003;98(3):355-377. Albert CM, Hennekens CH, O'Donnell CJ, et al. Fish consumption and risk of sudden cardiac death. JAMA. 1998;279(1):23-28. · Lemaitre RN, King IB, Mozaffarian D, Kuller LH, Tracy RP, Siscovick DS. n-3 Polyunsaturated fatty acids, fatal ischemic heart disease, and nonfatal myocardial infarction in older adults: the Cardiovascular Health Study. Am J Clin Nutr. 2003 Feb;77(2):319-25. · Leren P. The Oslo diet-heart study. Eleven-year report. Circulation. 1970;42(5):935-942. · Marchioli R, Barzi F, Bomba E, et al. Early protection against sudden death by n-3 polyunsaturated fatty acids after myocardial infarction: time-course analysis of the results of the Gruppo Italiano per lo Studio della Sopravvivenza nell'Infarto Miocardico (GISSI)-Prevenzione. Circulation. 2002;105(16):1897-1903. · Mensink RP, Katan MB. Effect of dietary fatty acids on serum lipids and lipoproteins. A meta-analysis of 27 trials. Arterioscler Thromb. 1992;12(8):911-919. · Miettinen M, Turpeinen O, Karvonen MJ, Pekkarinen M, Paavilainen E, Elosuo R. Dietary prevention of coronary heart disease in women: the Finnish mental hospital study. Int J Epidemiol. 1983;12(1):17-25. · Morris MC, Manson JE, Rosner B, Buring JE, Willett WC, Hennekens CH. Fish consumption and cardiovascular disease in the physicians' health study: a prospective study. Am J Epidemiol. 1995;142(2):166-175. · Mozaffarian D, Ascherio A, Hu FB, et al. Interplay between different polyunsaturated fatty acids and risk of coronary heart disease in men. Circulation. 2005;111(2):157-164. · Mozaffarian D, Bryson CL, Lemaitre RN, Burke GL, Siscovick DS. Fish intake and risk of incident heart failure. J Am Coll Cardiol. 2005 Jun 21;45(12):2015-21. · Mozaffarian D, Geelen A, Brouwer IA, Geleijnse JM, Zock PL, Katan MB. Effect of fish oil on heart rate in humans. A meta-analysis of randomized controlled trials. Circulation 2005;112:1945-1952. · Mozaffarian D, Lemaitre RN, Kuller LH, Burke GL, Tracy RP, Siscovick DS; Cardiovascular Health Study. Cardiac benefits of fish consumption may depend on the type of fish meal consumed: the Cardiovascular Health Study. Circulation. 2003 Mar 18;107(10):1372-7. · Mozaffarian D, Longstreth WT Jr, Lemaitre RN, Manolio TA, Kuller LH, Burke GL, Siscovick DS. Fish consumption and stroke risk in elderly individuals: the cardiovascular health study. Arch Intern Med. 2005 Jan 24;165(2):200-6. Erratum in: Arch Intern Med. 2005 Mar 28;165(6):683. · Mozaffarian D, Psaty BM, Rimm EB, Lemaitre RN, Burke GL, Lyles MF, Lefkowitz D, Siscovick DS. Fish intake and risk of incident atrial fibrillation. Circulation. 2004 Jul 27;110(4):368-73. Epub 2004 Jul 19. · Mozaffarian D. Does alpha-linolenic acid intake reduce the risk of coronary heart disease? A review of the evidence. Altern Ther Health Med. 2005;11(3):24-30. · Nilsen DW, Albrektsen G, Landmark K, Moen S, Aarsland T, Woie L. Effects of a high-dose concentrate of n-3 fatty acids or corn oil introduced early after an acute myocardial infarction on serum triacylglycerol and HDL cholesterol. Am J Clin Nutr. 2001;74(1):50-56. · Oh K, Hu FB, Manson JE, Stampfer MJ, Willett WC. Dietary fat intake and risk of coronary heart disease in women: 20 years of follow-up of the nurses' health study. Am J Epidemiol. 2005;161(7):672-679. · O'Keefe JH Jr, Abuissa H, Sastre A, Steinhaus DM, Harris WS. Effects of omega-3 fatty acids on resting heart rate, heart rate recovery after exercise, and heart rate variability in men with healed myocardial infarctions and depressed ejection fractions. Am J Cardiol. 2006 Apr 15;97(8):1127-30. Epub 2006 Mar 3. Oomen CM, Ocke MC, Feskens EJ, Kok FJ, Kromhout D. alpha-Linolenic acid intake is not beneficially associated with 10-y risk of coronary artery disease incidence: the Zutphen Elderly Study. Am J Clin Nutr. 2001;74(4):457-463. · Orencia AJ, Daviglus ML, Dyer AR, Shekelle RB, Stamler J. Fish consumption and stroke in men. 30-year findings of the Chicago Western Electric Study. Stroke. 1996;27(2):204-209. · Pietinen P, Ascherio A, Korhonen P, et al. Intake of fatty acids and risk of coronary heart disease in a cohort of Finnish men. The Alpha-Tocopherol, Beta-Carotene Cancer Prevention Study. Am J Epidemiol. 1997;145(10):876-887. · Rallidis LS, Paschos G, Liakos GK, Velissaridou AH, Anastasiadis G, Zampelas A. Dietary alpha-linolenic acid decreases C-reactive protein, serum amyloid A and interleukin-6 in dyslipidaemic patients. Atherosclerosis. 2003;167(2):237-242. · Sacks FM, Katan M. Randomized clinical trials on the effects of dietary fat and carbohydrate on plasma lipoproteins and cardiovascular disease. Am J Med. 2002;113 Suppl 9B:13S-24S. · Sacks FM, Stone PH, Gibson CM, Silverman DI, Rosner B, Pasternak RC. Controlled trial of fish oil for regression of human coronary atherosclerosis. HARP Research Group. J Am Coll Cardiol. 1995;25(7):1492-1498. · Schmier JK, Rachman NJ, Halpern MT. The cost-effectiveness of omega-3 supplements for prevention of secondary coronary events. Manag Care. 2006 Apr;15(4):43-50. · Shekelle RB, Shryock AM, Paul O, et al. Diet, serum cholesterol, and death from coronary heart disease. The Western Electric study. N Engl J Med. 1981;304(2):65-70. · Simon JA, Hodgkins ML, Browner WS, Neuhaus JM, Bernert JT Jr, Hulley SB. Serum fatty acids and the risk of coronary heart disease. Am J Epidemiol. 1995 Sep 1;142(5):469-76. · Singh RB, Niaz MA, Sharma JP, Kumar R, Rastogi V, Moshiri M. Randomized, double-blind, placebo-controlled trial of fish oil and mustard oil in patients with suspected acute myocardial infarction: the Indian experiment of infarct survival--4. Cardiovasc Drugs Ther. 1997;11(3):485-491. · Siscovick DS, Raghunathan TE, King I, Weinmann S, Wicklund KG, Albright J, Bovbjerg V, Arbogast P, Smith H, Kushi LH, et al. Dietary intake and cell membrane levels of long-chain n-3 polyunsaturated fatty acids and the risk of primary cardiac arrest. JAMA. 1995 Nov 1;274(17):1363-7. · Turpeinen O, Karvonen MJ, Pekkarinen M, Miettinen M, Elosuo R, Paavilainen E. Dietary prevention of coronary heart disease: the Finnish Mental Hospital Study. Int J Epidemiol. 1979;8(2):99-118. · von Schacky C, Angerer P, Kothny W, Theisen K, Mudra H. The effect of dietary omega-3 fatty acids on coronary atherosclerosis. A randomized, double-blind, placebo-controlled trial. Ann Intern Med. 1999;130(7):554-562. · Wang C, Chung M, Balk E, Kupelnick B, DeVine D, Lawrence A, et al. Effects of omega-3 fatty acids on cardiovascular disease. Rockville,MD, USA: Agency for Healthcare Researchand Quality, 2004. Evidence Report/Technology Assessment 94. Accessed online March 26, 2006 at www.ncbi.nlm.nih.gov/books/bv.fcgi?rid = hstat1a.chapter.38290. · Yuan JM, Ross RK, Gao YT, Yu MC. Fish and shellfish consumption in relation to death from myocardial infarction among men in Shanghai, China. Am J Epidemiol. 2001;154(9):809-816. · Zampelas A, Panagiotakos DB, Pitsavos C, Das UN, Chrysohoou C, Skoumas Y, Stefanadis C. Fish Consumption Among Healthy Adults Is Associated With Decreased Levels of Inflammatory Markers Related to Cardiovascular Disease The ATTICA Study. J Am Coll Cardiol. 2005 Jul 5;46(1):120-4. · Zhao G, Etherton TD, Martin KR, West SG, Gillies PJ, Kris-Etherton PM. Dietary alpha-linolenic acid reduces inflammatory and lipid cardiovascular risk factors in hypercholesterolemic men and women. J Nutr. 2004;134(11):2991-2997. · Morris MC, Evans DA, Bienias JL, Tangney CC, Bennett DA, Wilson RS, Aggarwal N, Schneider J. Consumption of fish and n-3 fatty acids and risk of incident Alzheimer disease. Arch Neurol 2003 Jul;60(7):940-6. · Schaefer EJ, et al.Plasma Phosphatidylcholine (PC) Docosahexaenoic Acid (DHA), Fish Intake and Risk of Dementia. American Heart Association Scientific Sessions 2003. November 9-12 2003, Orlando Florida. Moderated Poster Sessions, APS.94.4M. Novel Environmental, Personal and Pharmacologic Risk Factors. · Calon F, Lim GP, Yang F, Morihara T, Teter B, Ubeda O, Rostaing P, Triller A, Salem N Jr, Ashe KH, Frautschy SA, Cole GM. Docosahexaenoic acid protects from dendritic pathology in an Alzheimer's disease mouse model. Neuron. 2004 Sep 2;43(5):633-45. · Fackelmann K. “Fishing for answers to Alzheimer's.” USA TODAY, http://www.usatoday.com/news/health/2004-11-16-fish-alzheimers_x.htm. Accessed 11/16/04. · Kalmijn S, Launer LJ, Ott A, Witteman JC, Hofman A, Breteler MM. Dietary fat intake and the risk of incident dementia in the Rotterdam Study. Ann Neurol. 1997 Nov;42(5):776-82. · Lichtenstein AH. Dietary fat and cardiovascular disease risk: quantity or quality? J Womens Health (Larchmt). 2003 Mar;12(2):109-14. Review. · Ludwig DS. Diet and development of the insulin resistance syndrome. Asia Pac J Clin Nutr. 2003;12 Suppl:S4. · Wijendran V, Hayes KC. Dietary n-6 and n-3 fatty acid balance and cardiovascular health. Annu Rev Nutr. 2004;24:597-615. Review. · Aas V, Rokling-Andersen MH, Kase ET, Thoresen GH, Rustan AC. Eicosapentaenoic acid (20:5 n-3) increases fatty acid and glucose uptake in cultured human skeletal muscle cells. J Lipid Res. 2006 Feb;47(2):366-74. Epub 2005 Nov 21. · Assies J, Lieverse R, Vreken P, Wanders RJ, Dingemans PM, Linszen DH. Significantly reduced docosahexaenoic and docosapentaenoic acid concentrations in erythrocyte membranes from schizophrenic patients compared with a carefully matched control group. Biol Psychiatry. 2001;49(6):510-522. · Auestad N, Scott DT, Janowsky JS, Jacobsen C, Carroll RE, Montalto MB, Halter R, Qiu W, Jacobs JR, Connor WE, Connor SL, Taylor JA, Neuringer M, Fitzgerald KM, Hall RT. Visual, cognitive, and language assessments at 39 months: a follow-up study of children fed formulas containing long-chain polyunsaturated fatty acids to 1 year of age. Pediatrics. 2003 Sep;112(3 Pt 1):e177-83. · Buydens L, Branchey M, Roy A. N-3 Polyunsaturated Fatty Acids Decrease Feelings of Anger in a Population of Substance Abusers. Neuropsychopharmacology. , 2005;30(1):S87-S88. · Buydens-Branchey L, Branchey M, McMakin DL, Hibbeln JR. Polyunsaturated fatty acid status and aggression in cocaine addicts. Drug Alcohol Depend. 2003 Sep 10;71(3):319-23. · Champeil-Potokar G, Denis I, Goustard-Langelier B, Alessandri JM, Guesnet P, Lavialle M. Astrocytes in culture require docosahexaenoic acid to restore the n-3/n-6 polyunsaturated fatty acid balance in their membrane phospholipids. J Neurosci Res. 2004 Jan 1;75(1):96-106. · Chiu CC, Huang SY, Su KP. Omega-3 polyunsaturated fatty acids for postpartum depression. Am J Obstet Gynecol. 2004 Feb;190(2):582-3; author reply 583. · Colin A, Reggers J, Castronovo V, Ansseau M. [Lipids, depression and suicide] Encephale. 2003 Jan-Feb;29(1):49-58. Review. French. · Colombo J, Kannass KN, Shaddy DJ, Kundurthi S, Maikranz JM, Anderson CJ, Blaga OM, Carlson SE. Maternal DHA and the development of attention in infancy and toddlerhood. Child Dev 2004;75:1254-1267. · Conklin SM, Harris JI, Manuck SB, Hibbeln JR, Muldoon MF. Plasma fatty acids are associated with normative variation in mood, personality, and behavior. Abstract 1228, American Psychosomatic Society 64th Annual Meeting, March 1-4, 2006, Denver, Colorado. Accessed online March 10, 2006 at http://www.psychosomatic.org/events/AbstractsForJournal06.pdf. · Cott J, Hibbeln JR. Lack of seasonal mood change in Icelanders. Am J Psychiatry. 2001 Feb;158(2):328. · Dennis CL. Preventing postpartum depression part I: a review of biological interventions. Can J Psychiatry. 2004 Jul;49(7):467-75. Review. · Edwards R, Peet M, Shay J, Horrobin D. Omega-3 polyunsaturated fatty acid levels in the diet and in red blood cell membranes of depressed patients. J Affect Disord. 1998 Mar;48(2-3):149-55. · Emsley R, Myburgh C, Oosthuizen P, van Rensburg SJ. Randomized, placebo-controlled study of ethyl-eicosapentaenoic acid as supplemental treatment in schizophrenia. Am J Psychiatry. 2002;159(9):1596-1598. · Fenton WS, Dickerson F, Boronow J, Hibbeln JR, Knable M. A placebo-controlled trial of omega-3 fatty acid (ethyl eicosapentaenoic acid) supplementation for residual symptoms and cognitive impairment in schizophrenia. Am J Psychiatry. 2001;158(12):2071-2074. · Fontani G, Corradeschi F, Felici A, Alfatti F, Migliorini S, Lodi L. Cognitive and physiological effects of omega-3 polyunsaturated fatty acid supplementation in healthy subjects. Eur J Clin Invest 2005;35:691-699. · Frangou S, Lewis M, McCrone P. Efficacy of ethyl-eicosapentaenoic acid in bipolar depression: randomised double-blind placebo-controlled study. Br J Psychiatry. 2006 Jan;188:46-50. · Freeman MP, Hibbeln JR, Wisner KL, Brumbach BH, Watchman M, Gelenberg AJ. Randomized dose-ranging pilot trial of omega-3 fatty acids for postpartum depression. Acta Psychiatr Scand. 2006 Jan;113(1):31-5. · Freeman MP. -3 fatty acids in psychiatry: a review. Ann Clin Psychiatry. 2000 Sep;12(3):159-65. Review. · Green P, Hermesh H, Monselise A, Marom S, Presburger G, Weizman A. Red cell membrane omega-3 fatty acids are decreased in nondepressed patients with social anxiety disorder. Eur Neuropsychopharmacol. 2006 Feb;16(2):107-13. Epub 2005 Oct 21. · Hakkarainen R, Partonen T, Haukka J, Virtamo J, Albanes D, Lonnqvist J: Is low dietary intake of omega-3 fatty acids associated with depression? Am J Psychiatry 2004; 161:567-569. · Hamazaki T, Sawazaki S, Itomura M, Asaoka E, Nagao Y, Nishimura N, Yazawa K, Kuwamori T, Kobayashi M: The effect of docosahexaenoic acid on aggression in young adults. A placebo-controlled double-blind study. J Clin Invest 1996; 97: 1129-1133. · Hibbeln JR, Linnoila M, Umhau JC, Rawlings R, George DT, Salem N Jr. Essential fatty acids predict metabolites of serotonin and dopamine in cerebrospinal fluid among healthy control subjects, and early- and late-onset alcoholics. Biol Psychiatry 1998; 44: 235-242. · Hibbeln JR, Salem N Jr. Dietary polyunsaturated fatty acids and depression: when cholesterol does not satisfy. Am J Clinical Nutr 1995; 62: 1-9. · Hibbeln JR, Salem N Jr. Risks of cholesterol-lowering therapies. Biol Psychiatry. 1996 Oct 1;40(7):686-7. · Hibbeln JR, Umhau JC, George DT, Salem N Jr. Do plasma polyunsaturates predict hostility and depression? World Rev Nutr Diet. 1997;82:175-86. Review. · Hibbeln JR, Umhau JC, Linnoila M, George DT, Ragan PW, Shoaf SE, Vaughan MR, Rawlings R, Salem N Jr. A replication study of violent and nonviolent subjects: cerebrospinal fluid metabolites of serotonin and dopamine are predicted by plasma essential fatty acids. Biol Psychiatry. 1998 Aug 15;44(4):243-9. · Hibbeln JR. Fish consumption and major depression (letter). Lancet 1998; 351: 1213. · Hibbeln JR. Seafood consumption and homicide mortality. A cross-national ecological analysis. World Rev Nutr Diet. 2001;88:41-6. · Hibbeln JR. Seafood consumption, the DHA content of mothers' milk and prevalence rates of postpartum depression: a cross-national, ecological analysis. J Affect Disord. 2002 May;69(1-3):15-29. · Hirayama S, Hamazaki T, Terasawa K. Effect of docosahexaenoic acid-containing food administration on symptoms of attention-deficit/hyperactivity disorder - a placebo-controlled double-blind study. Eur J Clin Nutr. 2004 Mar;58(3):467-73. · Horrobin DF, Manku MS, Hillman H, Iain A, Glen M. Fatty acid levels in the brains of schizophrenics and normal controls. Biol Psychiatry. 1991;30(8):795-805. · Huan M, Hamazaki K, Sun Y, Itomura M, Liu H, Kang W, Watanabe S, Terasawa K, Hamazaki T. Suicide attempt and n-3 fatty acid levels in red blood cells: a case control study in China. Biol Psychiatry. 2004 Oct 1;56(7):490-6. · Innis SM. Perinatal biochemistry and physiology of long-chain polyunsaturated fatty acids. J Pediatr 2003; 143(4 suppl):S1-S8Kalmijn S, van Boxtel MP, Ocke M, Verschuren WM, Kromhout D, Launer LJ. Dietary intake of fatty acids and fish in relation to cognitive performance at middle age. Neurology. 2004 Jan 27;62(2):275-80. · Iribarren C, Markovitz JH, Jacobs DR, Schreiner PJ, Daviglus M, Hibbeln JR. Dietary intake of n-3, n-6 fatty acids and fish: Relationship with hostility in young adults-the CARDIA study. Eur J Clin Nutr. 2004 Jan; 58(1): 24-31. · Joy CB, Mumby-Croft R, Joy LA. Polyunsaturated fatty acid supplementation for schizophrenia. Cochrane Database Syst Rev. 2003(2):CD001257. · Laugharne JD, Mellor JE, Peet M. Fatty acids and schizophrenia. Lipids. 1996;31 Suppl:S163-165. · Llorente AM, Jensen CL, Voigt RG, Fraley JK, Berretta MC, Heird WC. Effect of maternal docosahexaenoic acid supplementation on postpartum depression and information processing. Am J Obstet Gynecol. 2003 May;188(5):1348-53. · Locke CA, Stoll AL. Omega-3 fatty acids in major depression. World Rev Nutr Diet. 2001;89:173-185. · Maes M, Christophe A, Delanghe J, Altamura C, Neels H, Meltzer HY. Lowered omega3 polyunsaturated fatty acids in serum phospholipids and cholesteryl esters of depressed patients. Psychiatry Res. 1999;85(3):275-291. · Maes M, Smith R, Christophe A, Cosyns P, Desnyder R, Meltzer H. Fatty acid composition in major depression: decreased omega 3 fractions in cholesteryl esters and increased C20: 4 omega 6/C20:5 omega 3 ratio in cholesteryl esters and phospholipids. J Affect Disord. 1996 Apr 26;38(1):35-46. · Mamalakis G, Tornaritis M, Kafatos A. Depression and adipose essential polyunsaturated fatty acids. Prostaglandins Leukot Essent Fatty Acids. 2002;67(5):311-318. · Marangell LB, Martinez JM, Zboyan HA, Chong H, Puryear LJ. Omega-3 fatty acids for the prevention of postpartum depression: negative data from a preliminary, open-label pilot study. Depress Anxiety. 2004;19(1):20-3. · Marangell LB, Martinez JM, Zboyan HA, Kertz B, Kim HF, Puryear LJ. A double-blind, placebo-controlled study of the omega-3 fatty acid docosahexaenoic acid in the treatment of major depression. Am J Psychiatry. 2003;160(5):996-998. · Nemets B, Stahl Z, Belmaker RH. Addition of omega-3 fatty acid to maintenance medication treatment for recurrent unipolar depressive disorder. Am J Psychiatry 2002: 159: 477-479. · Nemets H, Nemets B, Apter A, Bracha Z, Belmaker RH. Omega-3 treatment of childhood depression: a controlled, double-blind pilot study. Am J Psychiatry. 2006 Jun;163(6):1098-100. · Noaghiul S, Hibbeln JR. Cross-national comparisons of seafood consumption and rates of bipolar disorders. Am J Psychiatry. 2003;160(12):2222-2227. · Otto SJ, de Groot RH, Hornstra G. Increased risk of postpartum depressive symptoms is associated with slower normalization after pregnancy of the functional docosahexaenoic acid status. Prostaglandins Leukot Essent Fatty Acids. 2003 Oct;69(4):237-43. · Parker G, Gibson NA, Brotchie H, Heruc G, Rees AM, Hadzi-Pavlovic D. Omega-3 Fatty acids and mood disorders. Am J Psychiatry. 2006 Jun;163(6):969-78. · Parker GB, Heruc GA, Hilton TM, Olley A, Brotchie H, Hadzi-Pavlovic D, Friend C, Walsh WF, Stocker R. Low levels of docosahexaenoic acid identified in acute coronary syndrome patients with depression. Psychiatry Res. 2006 Mar 30;141(3):279-86. Epub 2006 Feb 24. · Peet M, Brind J, Ramchand CN, Shah S, Vankar GK. Two double-blind placebo-controlled pilot studies of eicosapentaenoic acid in the treatment of schizophrenia. Schizophr Res. 2001;49(3):243-251. · Peet M, Horrobin DF. A dose-ranging exploratory study of the effects of ethyl-eicosapentaenoate in patients with persistent schizophrenic symptoms. J Psychiatr Res. 2002;36(1):7-18. · Peet M, Horrobin DF. A dose-ranging study of the effects of ethyl-eicosapentaenoate in patients with ongoing depression despite apparently adequate treatment with standard drugs. Arch Gen Psychiatry 2002: 59: 913-919. · Peet M, Murphy B, Shay J, Horrobin D. Depletion of omega-3 fatty acid levels in red blood cell membranes of depressive patients. Biol Psychiatry. 1998;43(5):315-319. · Pifferi F, Roux F, Langelier B, Alessandri JM, Vancassel S, Jouin M, Lavialle M, Guesnet P. (n-3) polyunsaturated fatty acid deficiency reduces the expression of both isoforms of the brain glucose transporter GLUT1 in rats. J Nutr 2005;135:2241-2246. · Pouwer F, Nijpels G, Beekman AT, Dekker JM, van Dam RM, Heine RJ, Snoek FJ. Fat food for a bad mood. Could we treat and prevent depression in Type 2 diabetes by means of omega-3 polyunsaturated fatty acids? A review of the evidence. Diabet Med. 2005 Nov;22(11):1465-75. Review. · Rees AM, Austin MP, Parker G. Role of omega-3 fatty acids as a treatment for depression in the perinatal period. Aust N Z J Psychiatry. 2005 Apr;39(4):274-80. Review. · Richardson AJ, Montgomery P. The Oxford-Durham study: a randomized, controlled trial of dietary supplementation with fatty acids in children with developmental coordination disorder. Pediatrics. 2005 May;115(5):1360-6. · Richardson AJ, Puri BK. A randomized double-blind, placebo-controlled study of the effects of supplementation with highly unsaturated fatty acids on ADHD-related symptoms in children with specific learning difficulties. Prog Neuropsychopharmacol Biol Psychiatry. 2002 Feb;26(2):233-9. · Sampalis F, Bunea R, Pelland MF, et al. Evaluation of the effects of Neptune Krill Oil on the management of premenstrual syndrome and dysmenorrhea. Altern Med Rev 2003;8: 171-179. · Silvers KM, Woolley CC, Hamilton FC, Watts PM, Watson RA. Randomised.